How much does it cost to travel to Haiti? How much money will you need in Haiti? HTG3,783 ($44) is the average daily price for traveling in Haiti. The average price of food for one day is HTG625 ($7.32). The average price of a hotel for a couple is HTG5,582 ($65). Additional pricing is in the table below. These average travel prices have been collected from other travelers to help you plan your own travel budget. Haiti is an island in the Caribbean, sharing the island with the Domincan Republic with the Caribbean Sea in the south and the Atlantic Ocean in the north. Haiti has a rich culture and is often considered to be a hidden gem of the Caribbean. Albeit the country's reputation for poverty and dangerous cities, Haiti's resort areas and major cities are safe enough for tourists, with the help of a guide. The language of Haiti is Creole and few people outside of the resorts speak English. Haiti experiences regular intense storms from June-November, making December-April the ideal times to visit when temperatures are in the 70's and 80's Fahrenheit and rain is minimal. Haiti's beautiful culture is not to be missed, one of the best places to experience this is at the Marche an Fer flea market in Port-au-Prince where you'll find crafts, produce, and clothing. Just be sure to bring a guide with you who speaks Creole to help you negotiate prices and navigate the busy market. You can also use the Tour Haiti travel company located in Port-au-Prince to help you plan a trip to explore the French Colonial era architecture and other major sights around the island such as the La Citadelle and Palais San Souci. The Citadelle is the largest fortress in the western hemisphere and features cannonballs and old weaponry along with beautiful views of the island. The Palais Sans Souci is the ruins of King Henri Christophe's Versace styled castle which was built in 1813 and became a World Heritage Site in 1982. Cities in Haiti range from resort villages to large, crowded cities. Port-au-Prince is Haiti's largest city and also the country's capital. You'll find the majority of hotels, beaches, and festivals here. Jacmel is a village that's fairly new to the tourism scene and is popular among backpackers thanks to it's laid back vibe and strong cultural and artistic ties. Ila a Vache is small island off the coast and is home to many resorts. 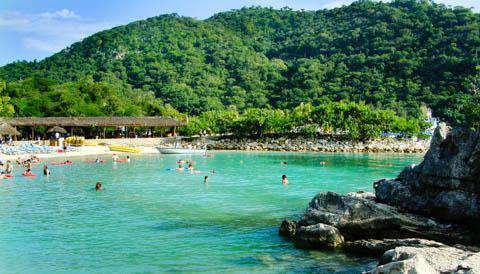 Another resort city is Labadee, which is an entirely fenced off area that has its own personal port for cruise ships. Finally, there is Petionville, a high end suburb or Port-au-Prince and considered much safer than the city center. Haiti offers gorgeous beaches where you can enjoy a swim in the cool waters, waterskiing, jet skiing, or just relax on the sand. For more swimming opportunities, check out the Bassin Bleu in the city if Jacmel where you can swim in the bright blue water and under the beautiful waterfall there. Once you've had enough swimming, go for a hike up Furcy Forest located near Jacmel where you can climb up the mountains to get incredible views of the surrounding island. Haiti is also well known for their Carnival celebrations which happen around Mardi Gras every year and combine local customs such as Voodoo and Haitian music with the traditional parade atmosphere of Carnival. Haiti has two airports, the Toussaint L'Ouverture and the International Cap-Haitien which are both located near Port-au-Prince. You can take a taxi from the airport to your destination or arrange for a shuttle bus from your hotel to pick you up. You can enter Haiti through it's neighboring country, the Dominican Republic, although it can be confusing and you should have a Haitian guide with you to help you translate. One of the easiest ways to get around Haiti is by private chauffer which you can usually find with the help of your hotel. Chauffeurs often act as both interpreters and guides, helping you find the best places to eat and show you hidden gems around the island. You can try to get around on the Tap Taps, which are modified trucks and buses, although they tend to get overcrowded and can be difficult to navigate without the help of a guide. Haitian food is a blend of French and African cuisine that features strong spices. Some popular dishes include roast goat called kabrit, fried pork called griot, and poulet creole which is chicken with a special creole sauce. On the coastal cities, you'll find fish and lobster infused with creole flare. You'll find delicious exotic fruit in Haiti, including guava, pineapple, mango, and banana. If you're a fan of rum, check out the Barbancourt distillery where you can try samples of their rum and pick up a few bottles to take home. Take extreme caution when it comes to the tap water in Haiti, it is often contaminated. Drink only bottled water and be mindful of any produce or meals made with the tap water.